Chance Hill Casino Review: 100% up to €100 bonus! Become a Chance Hill member and collect 100% up to €100 on top of your first deposit (in selected coutries) to play real money slots and other casino games for free! Get all the information you need in the following full casino review. New players at Chance Hill have some great deals in store, included an opportunity to play real money slots for free and double their bankroll instantly! Country-Specific Bonus: Grab Your Passport and Get the Bonus! One both the things we love about Chance Hill casino is that they seem to have the perfect bonus offer for everyone. They took time to study what players from different country want, and so they launched a variety of bonuses depending on geographies. Chance Hill Casino is giving all new players from the UK, Finland, Canada, Norway, Sweden, and Germany an exclusive offer once they make a first deposit. Make your first deposit and you can grab 100% up to €/$/£ 100 0r 1,000 kr. (if that’s your currency) to play any games on the platform. Keep in mind that this offer does come with a wagering requirement, and is only available to players living in the countries mentioned above. Not from any of these places? Here’s your Bonus! If you aren’t living in any of the countries mentioned above don’t worry, there’s also something special available for you to claim! 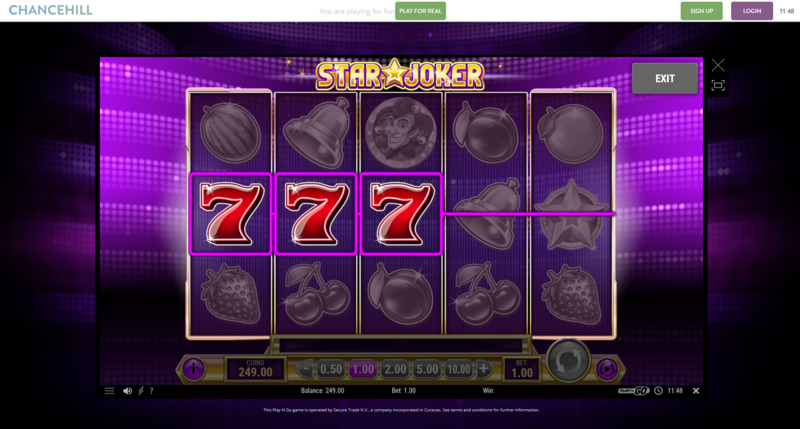 While not as juicy, you can collect 100% up to €50 in addition bonus cash as soon as you make a first deposit. Plus, you can also apply to join all the other promotion on the platform so - the more you play, the more you earn! Play hundreds of slots and table games at Chance Hill with your boosted bankroll on both desktop and mobile versions of this incredible online casino. Slot fans can enjoy a massive range of video slots including hits like Starburst, Dead or Alive, Flowers, Spinions, Jurassic World, Wild Wild West, Gonzo’s Quest and plenty of others from the best online casino game developers in the business. Progressives like Cosmic Fortune, Arabian Nights and the sky-high pots featured on Mega Moolah are also available to play. Get the best fixed and progressive jackpot games by joining Chance Hill today! In addition to plenty of slots, Chance Hill players can also enjoy popular casino classics like roulette, blackjack, Red Dog, and some incredible video poker titles around including Deuces Wild and Jacks or Better. Mobile Casino Games at Chance Hill! In addition to playing state of the art casino games from your desktop computer, Chance Hill members can enjoy all the features and games they love on a fully functional mobile version of the site. Plus there is an Android and iOS app in the making, so an even better mobile casino experience is on it's way for loyal members! If you have any questions that can't be answered with the info on the site, there's a member of Chance Hill's support team available via email, telephone or live chat to help you out. Get the help you need via any of these methods round the clock, guaranteed! Real money games and real big bonuses are just part of what makes Chance Hill a great online casino option for new players. Try it out with your exclusive offer today for a low risk shot at playing for some of the biggest jackpots on the web with a boosted bankroll! There are many deposit options on Chance Hill. You can choose the most convenient one for you.